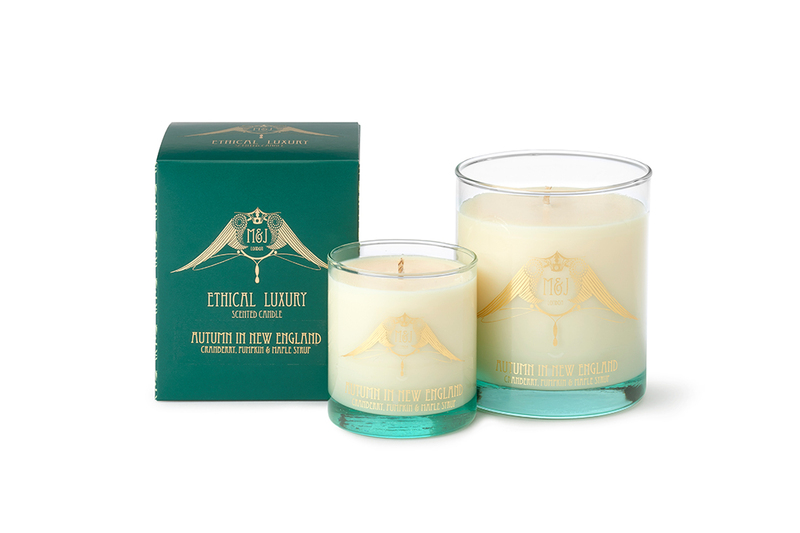 Ethical British brand M&J London have launched a stunning new autumnal candle called Autumn in New England and however much we certainly feel the chill in the air at this time of year the scents we are surrounded by are still warm fruity and close to our hearts so it makes everything not quite as chilly as it could be. The new one is made up of notes of Cranberry, Pumpkin, & Maple Syrup inspired by the countryside where the creative director Jennifer Mcnabb grew up. Jennifer says of the feel “We know it’s that time of year on the first morning we step outside into the chill and can see our breath puff in little clouds. That’s the signal to unearth wooly sweaters from the back of the closet, and don jackets and scarves as we set out for the day. This is the time we head for the hills – our annual pilgrimage north to the Green Mountains, to lose ourselves driving along winding country roads under and through a blazing canopy of leaves in bright blasts of yellow, flaming oranges, and the maple trees in fire-engine red. A white wooden steeple against the crisp blue sky is our beacon, guiding us into the village. At the farmers market on the green, bright orange pumpkins are piled high by the stacks of hay where we sit (carefully) and sip earthy apple cider (he drinks his cold but I know it’s best warmed and with cinnamon). In the chill of the evening after dinner, we share our cranberry tart while sitting around a bonfire snuggled under the weight of an ancient handmade quilt – scraps of dresses and skirts stitched together by some thrifty new Englander a generation or two ago. As the leaves fall and drift to the ground, we inhale deeply and take it all in – giving thanks for finding ourselves here again, with another year to mark the changing of the seasons.